I have a controversial opinion that I would like to share: I believe that the beauty and bulk of life lies tucked away in the moments where nothing is really happening. Between every grand and harrowing event in our existence, there are a multitude of breaths, pit-stops, and seconds that go unnoticed by some, if not by many. I make a point to paint these into my memory everywhere I go. 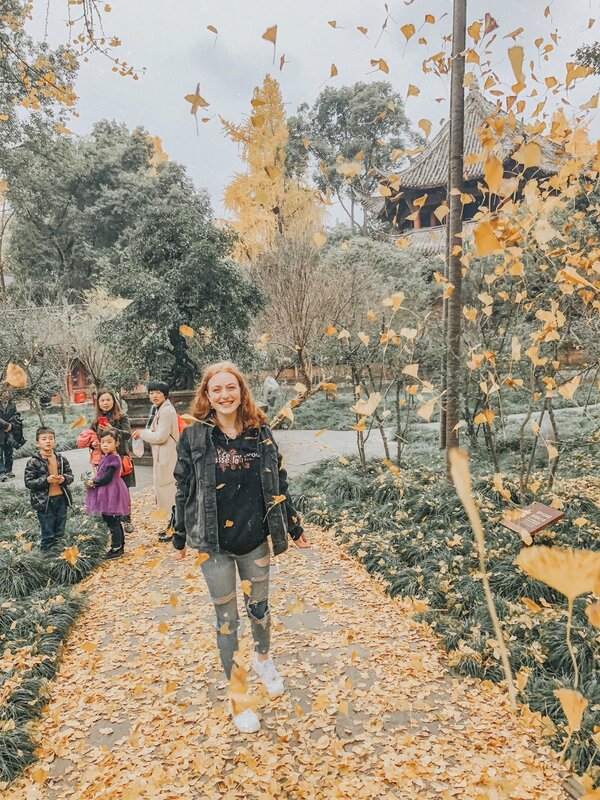 My trip to China was no exception to this rule-- I paid extra attention to those small, forgotten-by-others moments, and held them as close to me as I could. One particular moment that sticks with me was my first morning in Chengdu (and my first real morning in China at all) when I slumped over my breakfast plate, pondering what on Earth I was about to eat. The bean-and-cucumber combo was one unseen in my entire lifetime, and it was certainly something I was skeptical of trying. To my left sat a cup of warm orange juice to watch it down with. In that moment, it really hit me-- I was no longer at home, tucked behind a wall of Appalachian Mountains. I wasn’t eating a bowl of grits that I would wash down with a cup of coffee and cream. I was in China. This was the other side of my world, the place I had daydreamed about for ages, and, unbeknownst to me, the place that would forever change my life. Another seemingly small instant that I burned into my memory was one spent with my host family, wandering through an age-old temple. My world had just been painted yellow by the Ginkgo leaves that seemed to rain from the sky above. The lines defining the heavens and the earth were blurred each time the wind blew, and I had nothing to do but stand and gaze upward in awe. Everyone in the temple seemed to relish the moment just as I had. We were all united in wonder, despite our differences. While I didn’t understand the exclamations surrounding me, I knew that they were the same murmurings regarding the golden storm that were running through my head-- it was beautiful, breathtaking, and unbelievable. I was bonded to these people, these strangers that surrounded me, if only through our shared experience of the world’s beauty. Through moments like this, moments with people, I found perhaps the deepest personal impact of my trip to China. Human connections are not constricted by language, or distance, or even borders-- they are simple, and simply beautiful, and can bind you to people you may never see again if only through a rain of Ginkgo leaves. I felt that power of connection again when I was reunited with my former Chinese teacher, Lou Laoshi. Every day back home I would pass her class forlornly and wish that I could hear her exclaim “Ni hao, Hou Xia!” from across the hallway. Now that she had moved back to China, I knew that she missed those hallway happenings too. Her care for me was simple, like the every-day moments that I had cherished (and missed) with her, and pure-- she had taken a train to Beijing to visit with me, if only for a few hours. I knew that even though we hadn’t seen each other every day like we had previously, we would reunite as old friends. On one of the coldest nights of the trip (and, might I add, the night where I purchased a giant coat), I was able to meet with her for dinner. She greeted me with the same kindness that bonded us together-- teacher with student, friend with friend. Despite our prolonged distance, we spent the hours chatting as if nothing had happened and she was still teaching in North Carolina. It reminded me of the times when she would sneak my Chinese IV class (we only had two students) to the Waffle House in town-- the only restaurant in our area. The flavors of a smothered and stacked hashbrown didn’t compare to the authentic Chinese food I was sharing with her, but the connection between us was just the same, and just as strong, as it had been back home. I think of those bonds and connections that I have made as strings. Once I have met someone, I am irrevocably tied to them-- through feelings, though experiences, even through love. I am tied to the person who made my bean-and-cucumber breakfast, I am tied to those people I saw in the temple, I am tied to my Chinese teacher, and I am tied to each fleeting moment I shared with strangers while I was in China. Now that I am home, halfway around the world, those strings stretch great lengths, but will never break. Those strings, those connections, are the greatest souvenir from my time abroad, and I’m so grateful that they will be woven into the person that I am becoming. 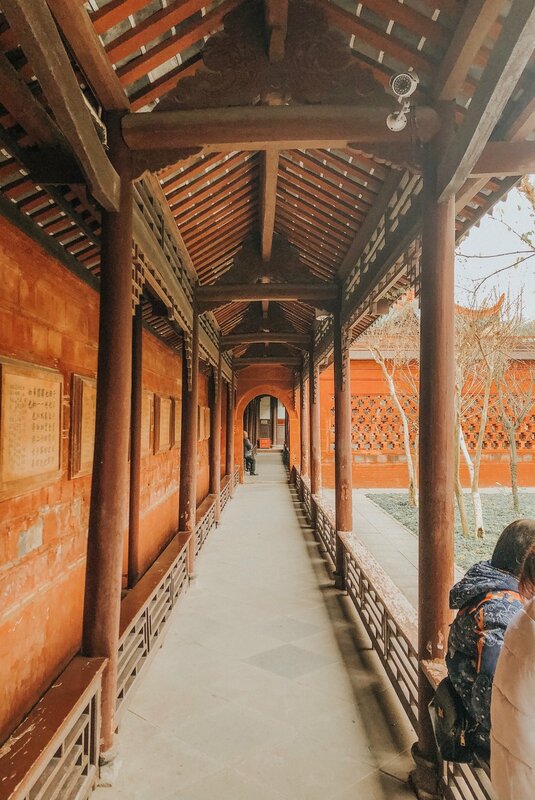 I would like to say a huge thank you to the Confucius Institute US Center for making all of this possible for me— from my education in the Chinese language to my first trip abroad. Thank you for forever changing who I am and who I’m becoming, and thank you for opening the world up to me.